Pale skin, shortness of breath, dizziness and brittle nails and hair. These are some of the symptoms of iron deficiency, a common nutritional deficiency that affects approximately two billion people in the world and may lead to anemia without proper treatment. 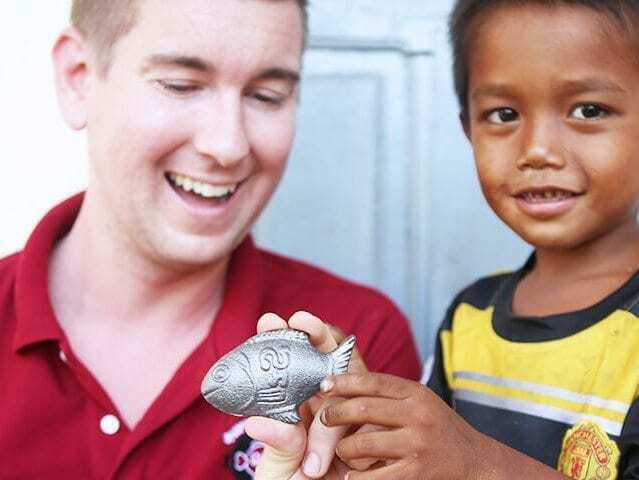 Iron deficiency is more prevalent in developing countries, which is what led Gavin Armstrong to found Lucky Iron Fish. Imagine being able to get 90% of your daily required intake of iron by simply dropping a tablet into your spaghetti sauce. Lucky Iron Fish has made this possible through a fish-shaped iron ingot that you can cook with and that is reusable for up to five years. Chris Charles, a board member at Lucky Iron Fish, invented the ingot after conducting research in Cambodia, where he found that the country’s residents had one of the highest rates of iron deficiency in the world (as high as 50%). Gavin, the founder and CEO of the benefit corporation (B Corp), brought the product to market after seeing the need for it in developing countries. “It’s challenging to see the negative impacts of iron deficiency in people’s everyday lives and there’s definitely a lack of knowledge about healthy eating in developing countries,” says Gavin. Cambodia played an important role in the creation of the product. At first, the product was just a chunk of cast iron. However, when the Lucky Iron Fish team tried to convince Cambodians to put the ingot into the food they were cooking, they were very hesitant. After doing a little digging, the team discovered that fish are a symbol of luck in Cambodia, so they decided to make the ingot in the shape of a fish. This simple change turned things around and the Cambodians were much more receptive to the friendly shape. The effects are palpable. Gavin says he hears from customers that they feel healthier and stronger, and that they don’t have as many headaches as they used to. One story he found particularly moving was that of a Cambodian woman who was using Lucky Iron Fish for her family but then gave the ingot to her sister, whose family was sick. “The woman gave an iron fish to them saying, ‘If it helped us, it’ll help you,’” Gavin recalls. Stories like this one are the reason why Gavin thinks being a part of a B Corp is worth it. B Corps are for-profit companies that are committed to doing business in socially responsible ways. As a B Corp, Lucky Iron Fish works to create a positive societal impact in all aspects of its business. When it comes to selling the fish, the company offers buy-one-give-one deals. 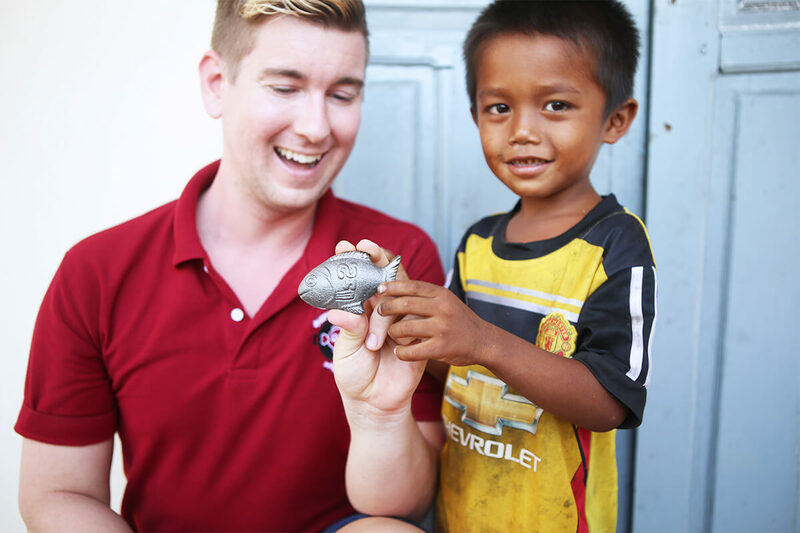 When people buy an iron fish for themselves, one is also given to a community in need. Lucky Iron Fish pins in support of the cause are also available for purchase, and a fish is given to a community in need for each pin purchased. Lucky Iron Fish also tries to give back to Cambodians by employing local workers. According to Gavin, it’s imperative for the company to have social value in everything that it does and that—contrary to what many traditional thinkers believe—it isn’t an added cost. With nine employees, a $2.3-million evaluation and over $1 million in grant funding for research, it’s clear that Lucky Iron Fish is set to continue making a positive impact on global health.